Recently, German media entered uncharted territory. While conservative newspapers have always identified the Greek government’s profligacy as root cause of the ongoing crisis, the liberal press had maintained more balanced positions. 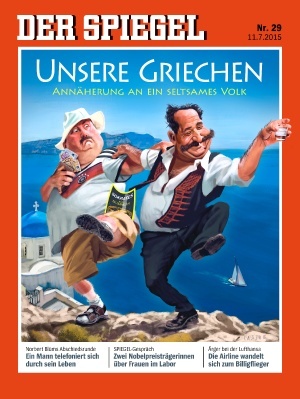 Yet on July 9, 2015, the weekly DIE ZEIT asked: ‘The Greek trap – the crisis-ridden country has a culture inimical to achievement. How can it be overcome?’ DER SPIEGEL proclaimed (in its July 11 issue) the necessity of ending the German romanticization of its arcadia in Attica. The title read: ‘Our Greeks – rapprochement with a strange people’. Since when has culture advanced as main explanation for a country’s (economic) misery? How can shortcomings in a state bureaucracy be taken to explain an entire people’s failure of achieving prosperity and societal welfare? In logical consequence of this narrative, the subsequent Eurozone-Greece agreement of July 13, 2015 figured as ‘the most intrusive economic supervision program ever mounted in the EU’ (FT). The drastic measures alongside the required ‘ownership’ of reforms revealed the deep mistrust in Greek institutions. The source of most, if not of all, failures was located in the Greek government’s incapacity, or reluctance, to accept conditionalities and implement reforms. This is yet another instance of misinterpreting the symptoms of a disease rooted in the fundamental misalignments within the Eurozone. There have been idiosyncratic issues in Greece (reporting failures, unsustainable debt since 2010), just as there have been home-grown issues in other crisis-hit member states contributing to the current escalation. However, these problems represent only the tip of the iceberg. It is not the misbehavior of individual governments, let alone cultures, which underlie the seven-year-old crisis. It is persistent failures in the economic governance of the Eurozone. Recent data from other Southern members are hailed as heralding the end of misery (EC, Reuters, FT, WSJ). The following discussion will demonstrate to the contrary: as long as the shortcomings in the institutional set-up of the Euro and the failures of member state coordination of fiscal policies persist, the crisis will continue. Greece today, who tomorrow? Unit labor costs, the ratio of total labor costs to productivity, are interpreted as the best approximation of an economy’s competitiveness. Judged by these standards, today’s Germany is competitive. This is not merely due to its superior productivity though. German multinationals as well as the famed Mittelstand are very capable. But the great divergence of unit labor costs compared to Southern European economies was due to wage restraints and welfare cuts, beginning with Schröder’s Agenda 2010 in the early 2000s (Mickey Levy, Flassbeck, Spiecker, The Economist). Addressing ‘the sick man of the Euro’, the reforms (and other factors) put the German economy ahead. This was achieved, however, at the cost of society’s lower strata and its Euro partners, as evidenced by subsequent divergences in balance of payments across the Eurozone (Gavin Davies). Bound by the Euro, others could no longer devalue their national currencies to improve competitiveness. During the decade of the European boom, no one seemed to worry. Southern economies expanded strongly, while Northern capital was flowing in and financed investments and consumption. Consumption of Northern, of German goods for that matter. Apparently unnoticed, Eurozone’s North and South diverged. Since the onset of adjustment programs across Europe, however, unit labor cost convergence has moved center stage. Yet this is not a joint effort – i.e. via wage restraint, reforms and export-orientation in the South combined with wage increases, fiscal expansion and domestic consumption in the North. Instead, the benchmark has been set by Germany and Northern Europe, and the others are asked to adjust. During the past years, Southern economies have undertaken enormous efforts. Greece, above all, is the star pupil (OECD, Economonitor). But to little avail. And even if the recent recovery across Europe (except Greece) proved sustainable – when every Eurozone member strives to become ‘competitive’, who will act as counterpart? The German ‘Sparpolitik’ in the 2000s was offset by Southern expansion. Who is buying now, when everyone is saving? Divergences of unit labor costs, clouded by the boom, were further reinforced by the ECB’s single nominal interest rate. Paul de Grauwe and Notre Europe argue that increasing inflation in booming Southern economies lowered real interest rates, thereby rewarding further economic expansion. The reverse was true for the North, which still profited of huge export-gains. Additionally, due to increasing real exchange rate spreads the prices of comparable products across member states diverged, making Northern manufacturing more and more attractive (Vistesen, Dadush, Wyne). Hence economic dynamics pushed states further into imbalances, not merely the often denounced human fallacies. Where is the public discussion about these curious, and obviously significant, dynamics? A second issue identified by de Grauwe is the lack of a lender of last resort. Since the late 19th century, any central bank’s mandate has included the provision of unlimited liquidity in times of financial panic; not so in the Eurozone. When the financial crisis hit Europe, each member had to clean its own doorstep. Capital fled to presumably safer Northern countries and Southerners dried up. The lack of affordable refinancing forced spending cuts, thereby inducing immediate austerity programs. The cuts diminished GDP, which made servicing debt even harder. And only then the European austerity programs were devised and implemented. The question arises: were state budgets ultimately unsustainable and Southerners righteously punished for profligacy? Or did they simply look weaker relative to Northern neighbors, which were favored by investors in times of uncertainty? Evidence points to the latter. Nevertheless, these are the discussions we Europeans should hold. Despite improvements in financial governance, such as the banking union or the ECB’s perennial setting of precedents, the economic structure of the Eurozone has seen little of the desperately needed changes (e.g. Hans Tietmeyer, Euractiv). As long as there is not some kind of fiscal union, as long as there are not some kind of common Eurozone debt instruments, the inherent fragilities persist. Furthermore, the majority of European policymakers remain bound to their national constituencies – why should they care for the whole of Europe, when their electoral mandate stems from a fraction of the people? We need a European debate. A debate about the flawed narrative that the Greek government’s profligacy is said to have caused the economic and political crises; a debate concerning the interpretation of the crisis as a mere lack of competitiveness (what about the European welfare state by the way? ); and a debate with regard to the absurd claims about “cultural” limits to economic growth. Vincent Dreher is a PhD student at the Berlin Graduate School for Transnational Studies. He works on the Political Economy of International Money and Finance, with a focus on international institutions. Here’s an interesting addition to the debate at the (German-language) SiPo-Blog, focusing on the media representation / narratives: http://www.sicherheitspolitik-blog.de/2015/07/30/hilfspaket-fuer-deutsche-medien-annaeherungen-an-unser-bild-vom-pleite-griechen/ It went online shortly after Vincent’s piece.